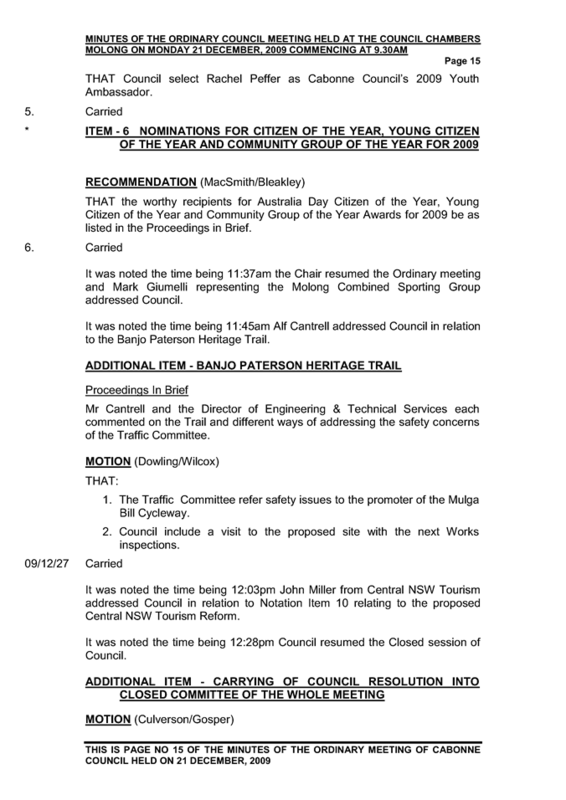 Your attendance is respectfully requested at the Ordinary Meeting of Cabonne Council convened for Monday 15 February 2010 commencing at 9.30am, at the Cabonne Shire Office, Bank Street, Molong to consider the undermentioned business. 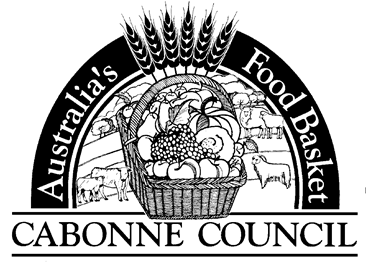 Cabonne Council is committed to providing sustainable local government to our rural communities through consultation and sound financial management which will ensure equitable resource allocation. 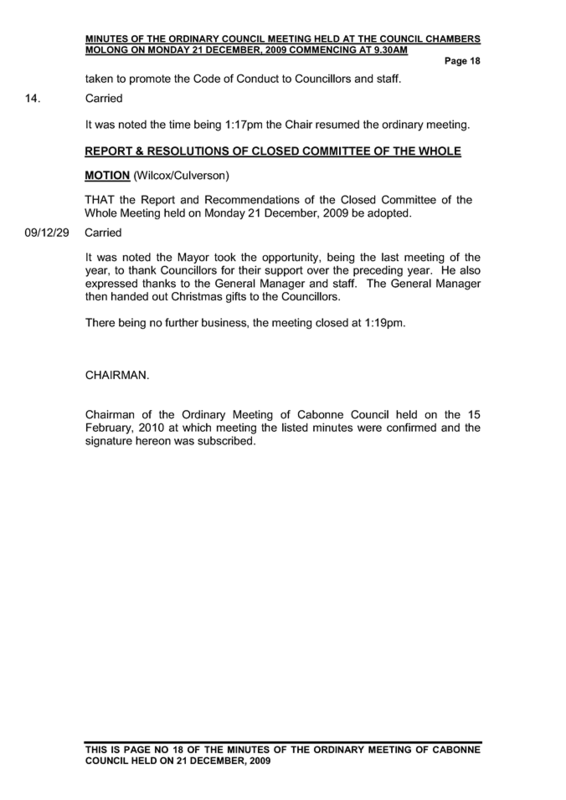 To allow tendering of apologies for Councillors not present. A call for apologies is to be made. THAT any apologies tendered be accepted and the necessary leave of absence be granted. To allow an opportunity for councillors to declare an interest in any items to be determined at this meeting. A call for declarations of interest. THAT the Declarations of Interest be noted. To allow consideration of the Mayoral Minute plus Other Councillors' Reports. A call for the Mayoral Minute to be read out as well as other Councillors’ Reports. THAT the Mayoral Minute be adopted. To allow an opportunity for councillors to declare any political donations received. A call for Political Donations. THAT any Political Donations be noted. The following minutes are attached for endorsement. 1. 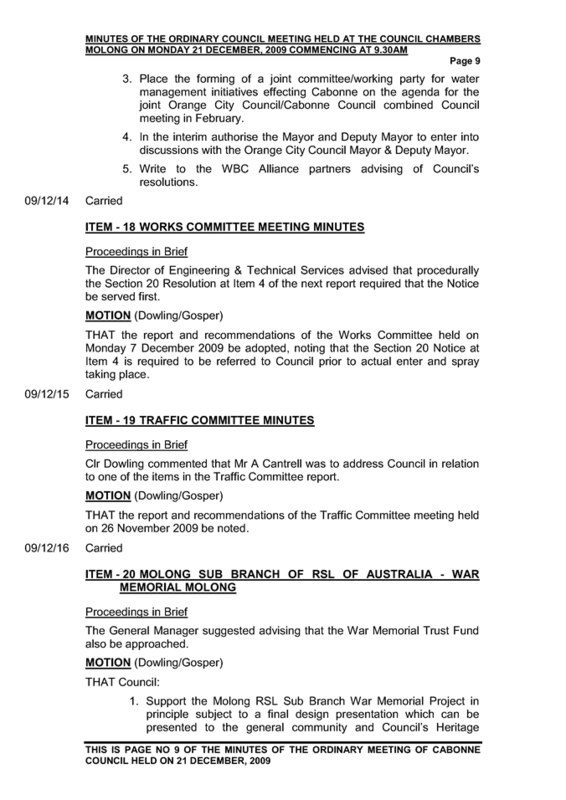 Minutes of the Ordinary Council meeting held on 21 December 2009. 2. 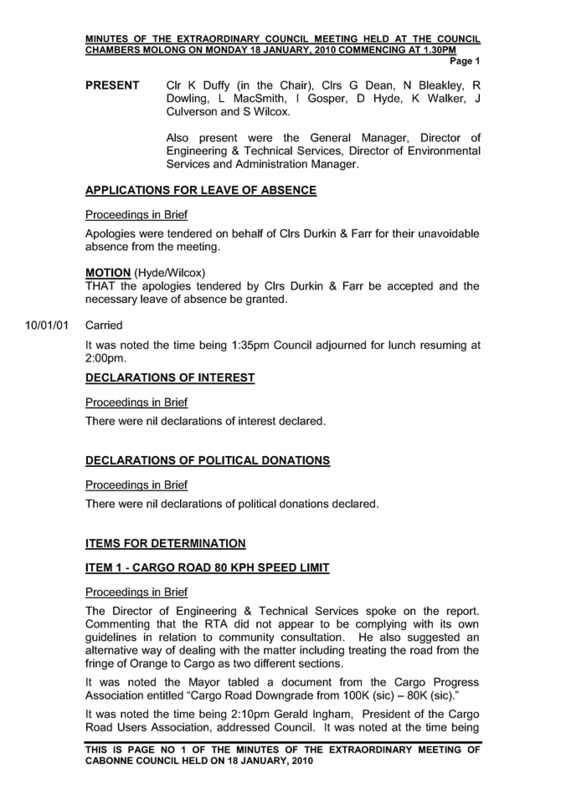 Minutes of the Extraordinary Meeting held 18 January 2010. THAT the minutes of the Ordinary Meeting held on 21 December 2009 and the Extraordinary Meeting held on 18 January 2010 be adopted. 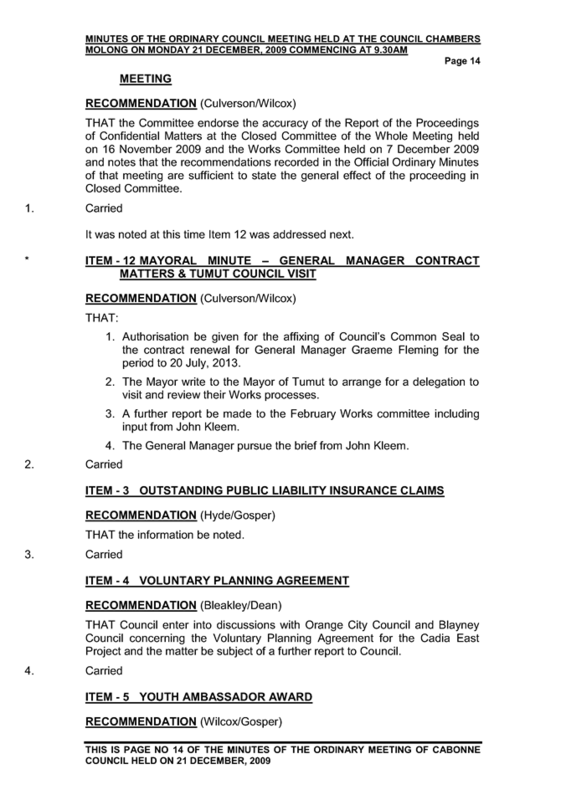 Provides an opportunity for Councillors to call items for noting for discussion and recommends remainder to be noted. 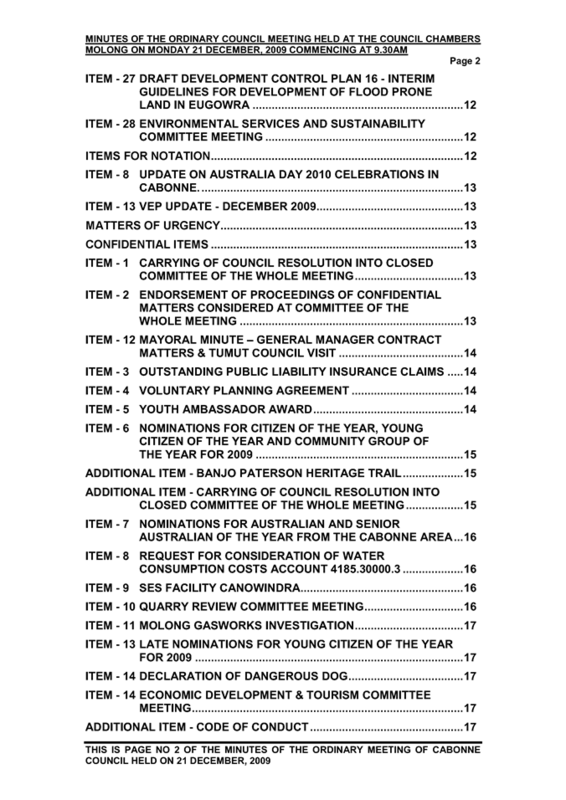 In the second part of Council’s Business Paper are items included for Council’s information. In accordance with Council’s format for its Business Paper, Councillors wishing to discuss any item are requested to call that item. 1. Councillors call any items they wish to further consider. 2. The balance of the items be noted. To provide advice of the 2010 E-Division Conference to be held in Molong on Friday 26 March 2010 and invite the submission of Motions. Yes - depending upon Motions presented to E Division and carried at the Annual Conference of the Shires Association. Council has received advice from the Secretary of the E Division of the Shires Association of NSW that the 2010 Conference will be held in Molong on 26 March 2010. At present we have not received information regarding the agenda however as always time will be devoted to the consideration of Motions to be submitted to the Annual Conference of the Shires Association which will be held in Sydney in June. Councillors are asked to give consideration to any Motions that may be appropriate to submit to the E Division Conference. 1. Council representatives attend the E Division Conference to be held in Molong on Friday 26 March 2010. 2. Council give consideration to the formulation of any appropriate Motion/s to be submitted to the E Division Conference. Update Councillors on issues covered at the Code of Conduct briefing at the December Council meeting and outlining follow up actions. 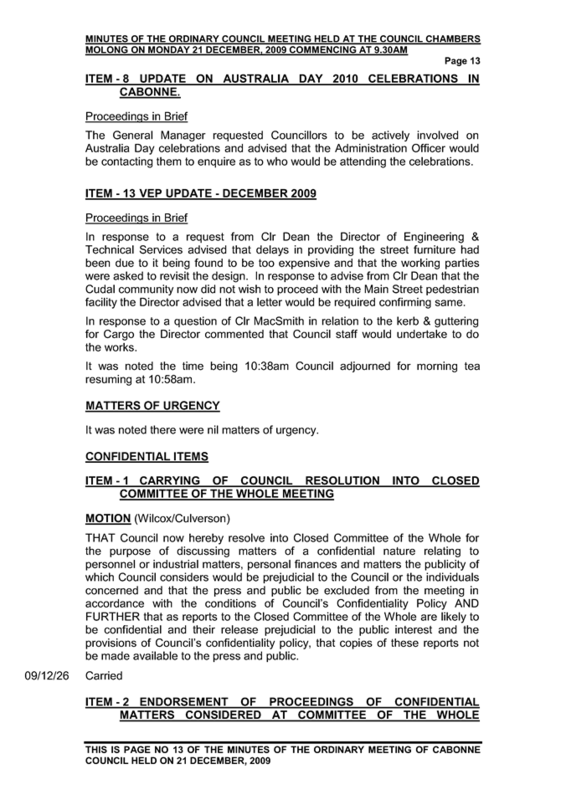 Council at its December meeting received an extensive briefing from the General Manager in relation to Code of Conduct issues and requested that the issues addressed and subsequent actions be subject of a follow up report to the February meeting. 4) Reinforcing the display and availability of Council’s Code of Conduct on Council’s website. 6) Inviting anyone with any queries or comments in relation to the Code of Conduct to contact the Director of Finance & Corporate Services or the General Manager. 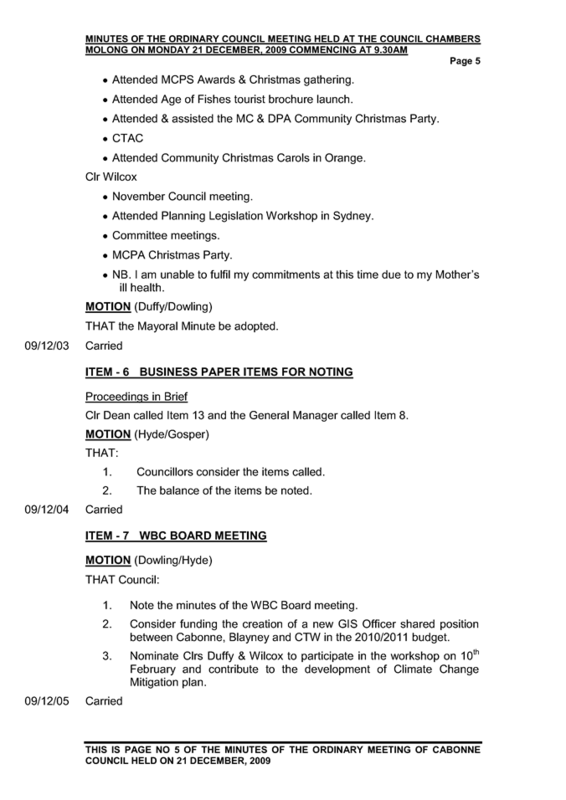 THAT Council note the issues covered in the Code of Conduct briefing and subsequent follow up actions. The lease of the land of the current Byng/Emu Swamp Rural Fire Brigade Station is soon to expire and the landholder has indicated that he is not prepared to renew that lease necessitating a change of location for a future facility. Funding has been provided in the 2010/2011 Rural Fire Fighting Fund for the Byng/Emu Swamp Brigade along with the March Brigade. A local landholder and Brigade owner has offered a parcel of land to Council by way of a 99 year lease for the building of the new brigade area. The NSW Rural Fire Service have written to Council urging Council to enter in such a lease as soon as possible to enable them to commence construction possibly as early as August 2010. The lease would be with Talbri Pty Ltd and will involve Council incurring some expenditure for drafting of the document, however this is not considered to be of a significant amount and can be funded from surplus funds within the Rural Fire Service area. Report on information provided by the Shires Association of NSW. 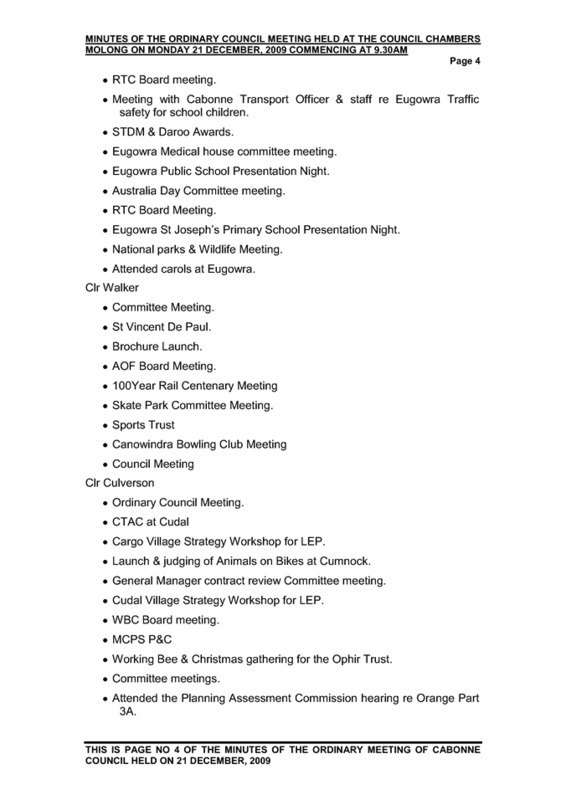 Should any Councillor be interested in viewing any of the above mentioned items they should contact the Director of Finance and Corporate Services to arrange a meeting. The Department of Local Government (DLG) released Practice Note No 9 - Complaints Management in Councils, a joint publication of the Department of Local Government and the NSW Ombudsman to assist councils in the management and handling of complaints. It has been designed for use by councils to develop and implement effective complaints management systems. An effective complaints management system is an essential part of the provision of quality service in local government. It is one method of measuring community satisfaction and provides a useful source of information and feedback for improving a council’s services. Complaint handling is also a key component of sound corporate governance and is fundamental to ensuring an appropriate level of accountability in the exercise of council functions. This publication provides an analysis of the reasons people complain, and outlines how complainants should be treated. It also provides a model approach to complaint handling and sets out the essential features of a complaints management system. It also addresses the issue of dealing with unreasonable conduct by complainants. The information in this practice note is based on the 2004 edition of the NSW Ombudsman’s Effective Complaint Handling Guidelines. This is consistent with the Australian Standard, Customer Satisfaction – Guidelines for Complaints Handling in Organizations (ISO 10002:2006, MOD). The practice note also incorporates research recently undertaken by the NSW Ombudsman on managing the impact of unreasonable conduct of complainants on complaint handling agencies, as contained in their Unreasonable Complainant Conduct- Practice Manual 2009. This information has been adapted to specifically address the needs of councils. The DLG strongly encouraged councils to develop complaint handling policies and procedures that incorporate the essential features of an effective complaints management system described in the Practice Note. Council’s existing Complaints Handling Policy has been reviewed to ensure that it is consistent with best practice as described in the Practice Note. THAT Council adopt the annexed draft Complaints Management Policy. 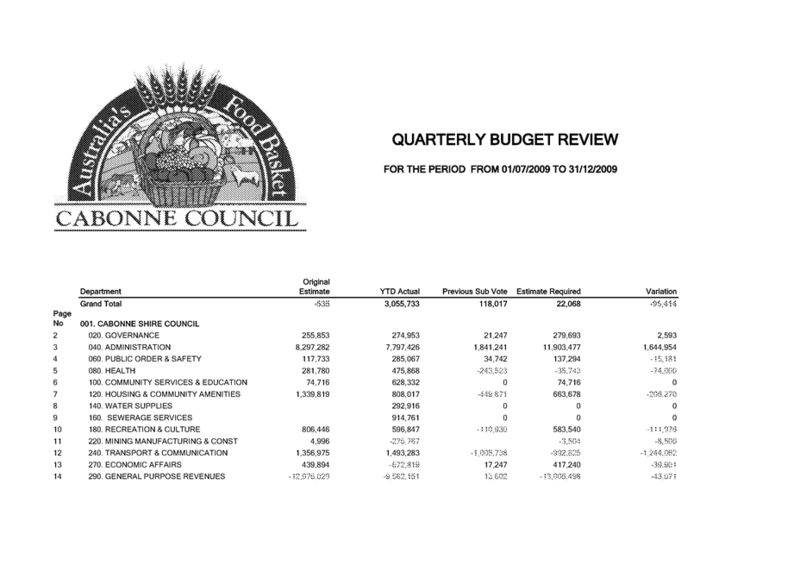 The December Quarterly Budget Review is presented to Council, in accordance with Council’s Management Plan. Meetings with the Managers of the various Departments of Council have taken place, where possible to consider the appropriate changes to be made to the 2009/2010 budget. No variances of significance in this area. Assets, that is new and revision of current are noted here with funds in excess of $1.75 million being allocated. Part of this amount however includes Federal funds, originally intended for resurfacing and rehabilitation maintenance redirected to the asset area of Obley Road. These funds amount to $1,017,130. $438,630 has been reallocated from the Norah Creek Road to the Long Pont Road construction. The result of the movement of the reserves has been a reduction of reserve funds in the amount of $77,855. No change has been made in the area of on costs and overheads, and this area will be reviewed at the March Quarterly Budget Review. It is noted that part of funds previously allocated to Council from the Rural Fire Service for fire hazard reduction have been withdrawn. $17,500 of the initial allocation of $40,000 has been reduced in this review. Income has been received for the construction of the Bush Fire Shed at Mandagery. These funds have been returned to the Mining reserve, where the original expense was taken at the end of 2008/09. In this area a contribution of $25,000 from the Molong CWA has been noted. This amount in intended to be given to Waluwin, to assist in the fitting out of the kitchen area in the new Health Centre. Additional funding of $50,000 has also been advised, again for the Waluwin Health Centre and is given by the Department of Regional Partnerships. No variances in this area. Additional income in the amount of $15,000 is noted in the area of the hiring of Council’s skip bins. It is estimated that based on current trends that the income in the area of Town Planning, specifically Development Applications will be increased by $18,000. Other recycling income of $14,842 is expected to be received and there are other minor changes in this area resulting in a savings of $5,661. The cost of servicing of Manildra Community septic tanks has increased and is expected to cost a further $11,811 bringing the total cost of this service to $22,500. Additional income of $10,000 is acknowledged in the area of public cemeteries and this amount has been temporarily placed into reserve until the final amount is realized at the end of the budget year. Regional Local and Community Improvement grant funding of $151,000 has been acknowledged in this area. This is the second round of funding and will be allocated to the Eugowra Pre School and the Canowindra Skate Park. Emergency drought assistance works, amounting to $300,000 for the Cumnock water supply have been noted in this section. $240,000 of this cost is to be grant funded and the remainder $60,000 is funded by reserve. No changes to variances are noted in this section. New equipment for Canowindra’s Memorial playground has been noted in this area under the Community Improvement Program. Playground equipment, soft fall and fencing have been provided. Funding is to be supplied by DEEWR in the amount $137,666. Other small funding amounts of $1,927 for the Yeoval Showground and $4,000 for the Molong Showground for an animal nursery may be provided. 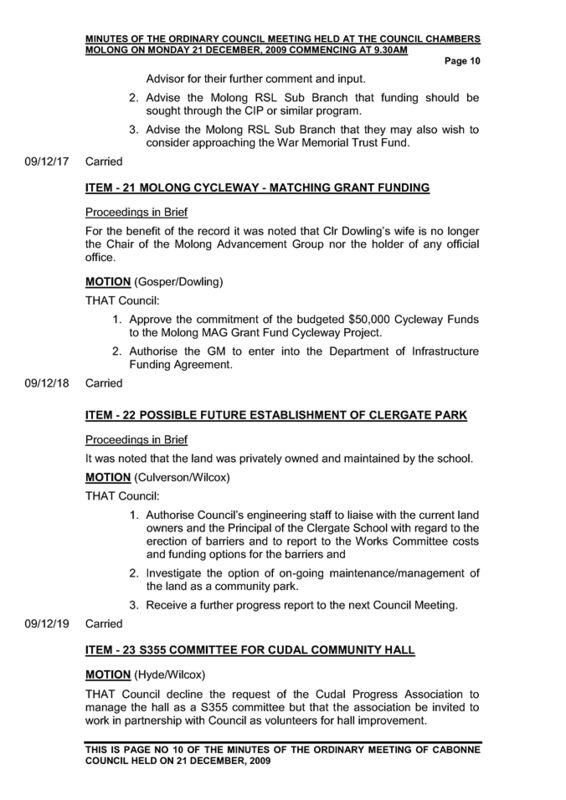 $93,455 grant funding for the Molong Cycleway has also been noted in this area. An increase in income of $8,500 in the area of building control is noted in this section. The redirection of funds for road works is noted in this section, as mentioned in the Administration section that is Obley Road. The final contribution for Molong Industrial estate is also noted. Additional funding for Gum Creek of $147,000 is noted. Additional funding is required for the Flash Jacks and the Amaroo Intersection projects and Council is continuing negotiations with the RTA to provide these funds. $311,222 has been reduced from Main Road 310 widening allocation. An additional amount of $100,000 has been provided State Road maintenance ordered works, $70,000 for Shoulder widening on Peabody Road and $30,000 for the removal of White Pine on Main Road 61. The expense of Bush Fire hazard reduction is reduced by $17,500 in this section. It is noted that there may be an increase in the income obtained in the area of Private works, this amount; $39,450 has been placed in reserve until the end of the year when it is known if the amount has been realized. Additional income is noted in this area for rates and waste charges. No change to the expected income for interest has been noted in this review. However, the increase in the average interest rate has increased from the estimated average interest rate of 2.75% to 3.81 %. Indications are that each month the rate is increasing and a better than expected result in the area of interest income is anticipated. It is noted, too, that funds to be invested are greater that the estimated average balance of monthly funds. This position will change as the Manildra sewerage scheme progresses and funds are withdrawn. THAT the variances noted in this budget review be endorsed by Council and that Council’s 2009/2010 Budget be amended to reflect the changes. To update Council on the activation of the system and seek endorsement to actively promote the use of solar and alternate power generation. Council identified in its 2007/2008 Management Plan an objective to “manage Council’s appropriate response to Climate Change at a local government level." One of the performance measures was that Cabonne Council's response be consistent with other local government areas. Council at its July 2007 Council meeting resolved to install a 5kWh solar grid-connect system on the Waluwin Community Centre. The system was expected to have a 17 year payback period with anticipated results in green house gas reductions of 8.8 tonnes – equal to taking 38.5 cars off the road each year. On 1 January 2010 the New South Wales Government's Gross Feed-In Tariff Scheme came into effect. Under the scheme, gross metered customers with small scale distributed photovoltaic (PV) systems and wind turbines will be paid 60 cents per kilowatt hour for all solar energy that is produced by the system for a guaranteed 7 years. This Scheme applies to the Waluwin system and effectively this means that the payback period will now be reduced to approx. 8 years with Council receiving approx. $5,000pa for the electricity generated by the system. Council will now require a gross meter to record the total amount of energy generated by the small solar PV system to receive the full benefit of the scheme. Country Energy will provide customers with a gross meter at no additional charge however the installation of the new meter is at Council’s expense and is to be done by an appropriately qualified Accredited Service Provider. It is anticipated the meters will be available by mid March: under transitional arrangements Council, as an existing net metered customer, will receive 60 cents per kilowatt hour for all excess electricity that is fed into the grid after Waluwin’s electrical needs are met. Realistically there is little excess electricity anticipated so the new Scheme (paying for all solar energy generated) is a financial bonus for Council. A Media Release was recently distributed and a brochure produced for pick up by interested visitors to the Waluwin Centre. A promotional package for distribution to WBC and CENTROC councils is also being prepared. Council has already received an enquiry from Narrabri Council staff who heard about Cabonne’s initiative. THAT Council actively promote use of Solar and alternative energy throughout the Cabonne Local Government Area. To advise Council that the Local Government Remuneration Tribunal (Tribunal) has commenced its review for the 2010 determination. The Tribunal is required to make an annual determination on the fees payable to Councillors and Mayors. The Tribunal will be undertaking a review of the minimum and maximum fee levels for each Category. The Tribunal would welcome submissions from individual councils or joint submissions in regard to the quantum and/or structure of fees. Categories of councils and mayoral offices were last determined by the Tribunal in 2009. In accordance with Section 239 of the Act, the Tribunal is required to determine the categories of councils and mayoral offices at least once every 3 years. The Tribunal does not intend to undertake a further review of categories during the 2010 review but will review the categories again as part of the 2012 review. Until then the Tribunal would not expect to move councils within categories unless there is a significant change in the role and responsibilities of individual councils. The closing date for submissions to be received is 19 February 2010. 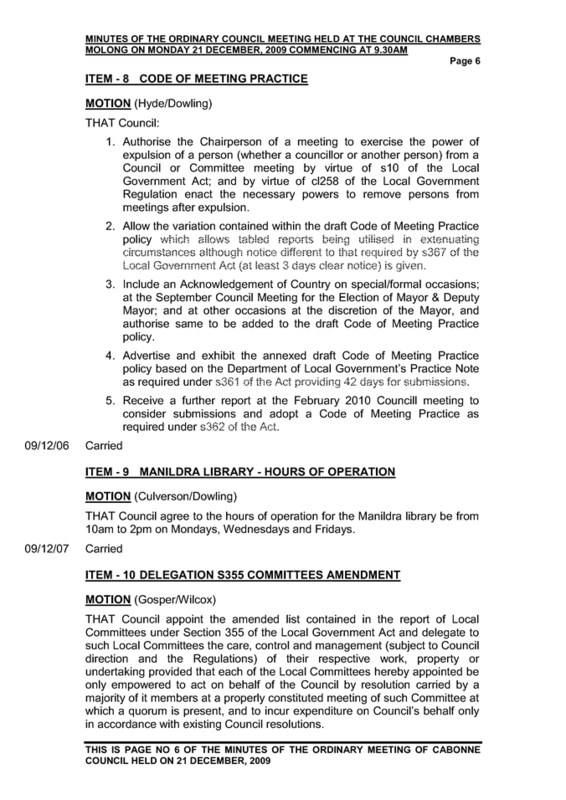 THAT Council advise the Administration Manager of any matter that it wishes to refer to the Local Government Remuneration Tribunal prior to the closing date of 19 February 2010. Council to review and adopt Policies within 12 months of being elected. 1. Policies recommended for deletion. Following an initial report to Council’s November 2009 Meeting, an initial Policies Workshop was held on 18 January 2010. The General Manager provided the following definitions with a view to clarifying what a “policy” is. General advice on how to handle a situation or an issue. Direction given by Statute or Regulations eg: Levying of Council Rates, Code of Meeting Practice. Decisions of Council predominantly made at an official Council Meeting in relation to an issue. Usually relate to an issue, event or point in time, binding on Council unless amended, rescinded, completed or no longer applicable. A firm direction or decision to handle a matter, issue or event which may occur immediately or on future occasions: binding on Council unless altered by a further decision of Council or on occasions by external events, legislation or regulations. Laid down by Federal or State Government, or Council management as steps to be followed in dealing with a particular issue e.g. : Noise Control Manual, Creditors Payments, Registering Mail – InfoXpert, Receipting payments at Counter. At the workshop the listing of Council’s policies with Staff Comment/Suggestions was addressed with the Mayor and councillors calling particular policies for which they wanted a further report. Due to time restrictions a further workshop was scheduled for the February Committees day with councillors requested to provide details of any policy they wished reported on to the Administration Manager. “Retain” - policies agreed to be readopted at this (February Council) meeting. Includes policies which were agreed to be readopted and for which amendments were agreed at the Workshops. “Review” - a further report is required by the Officer nominated and by the timeframe nominated to allow Council to consider adoption of a revised version or deletion of said policy. 1. Adopt the policies listed in the annexure as “Policies to be readopted’ to be included in Council’s Policy database. 2. Authorise the policies listed in the annexure “Policies recommended for deletion” to be removed from Council’s Policy database. 3. Adopt the current policies and receive further reports in relation to policies listed in the annexure “Policies to be reviewed and reported to Council”. In keeping with Council’s review of its Policy Database, the following policies (draft copies attached) were identified as having to be revised by Council’s Risk Management Officer and be resubmitted to Council for adoption. 1. Apology Policy – All apologies by Council in connection to Council’s roads or footpaths must be issued in accordance with this policy. 2. Occupational Health and Safety Policy - The Occupational Health and Safety of all persons employed by Cabonne Council and those visiting the organisation are considered to be of the utmost importance. Resources in line with the importance will be made available to comply with all relevant Acts and Regulations and to ensure that the workplace is safe and without risk to health. 3. Work Place Safety Audits and Inspections Policy - This policy relates to Council’s responsibilities in relation to workplace safety audits and inspections. To advice Council of model "template" wording for Contract Clauses to ensure Council's compliance with GIPA. Will impact on Council's Procurement Policy and Access to Council Information provisions. When a Council enters into a contract with a private-sector entity (contractor) to provide services to the public on its behalf, Council must have a contractual right to immediately access certain information in the contractor’s records. The Office of the Information Commissioner (“OIC”) has provided a guide to the relevant sections of the GIPA Act and two template contractual clauses. Does this apply to all private-sector contracts? Not all private-sector contracts are required to include the access to information clause. Section 121 of the GIPA Act applies to contracts “under which the contractor is to provide services to the public on behalf of a Council”. So section 121 will apply only to some of the contracts listed in Council’s register of contracts. They will be contracts for the provision of external services to the public, such as security contractors, special archivists, support services for seniors or health and education services. Section 121 is unlikely to apply to outsourced internal services to Council, such as for a Council’s office supplies, internal personnel, information technology or corporate support. Which information must be accessible? · received by the contractor from Council to enable it to provide the services. · information that, if revealed to Council, could place the contractor at a substantial commercial disadvantage in present or future dealings with Council. In the template below, subclauses (1) and (2) are drafted to comply with the minimum requirements of subs. 121(1) and (2) of the GIPA Act. This also requires the contractor to provide the requested information within seven (7) days of a request. The remainder of the clause goes beyond the statutory requirements. It requires the contractor to provide the requested information at its own expense and gives Council a right to terminate the contract if it does not do so. c) information received by the Contractor from Council to enable it to provide the services pursuant to the Contract. c) information that, if disclosed to Council, could reasonably be expected to place the Contractor at a substantial commercial disadvantage in relation to Council, whether at present or in the future. (3) The Contractor will provide copies of any of the information in sub-clause (1), as requested by Council, at the Contractor’s own expense. (4) Any failure by the Contractor to comply with any request pursuant to sub clause (1) or (3) will be considered a breach of an essential term and will allow Council to terminate the Contract by providing notice in writing of its intention to do so with the termination to take effect seven (7) days after receipt of the notice. Once the Contractor receives the notice, if it fails to remedy the breach within the seven (7) day period to the satisfaction of Council, then the termination will take effect seven (7) days after receipt of the notice. The template consultation clause below reflects Council’s obligations under section 54 of the GIPA Act to consult before providing access to information. Although Council is not required to include this clause in their private sector contracts, it may be useful in alerting contractors to their consultation and objection rights. c. those concerns may reasonably be expected to be relevant to the question of whether there is a public interest consideration against disclosure of the information. (2) If, following consultation between Council and the Contractor, the Contractor objects to disclosure of some or all of the information, the Contractor must provide details of any such objection (including the information objected to and the reasons for any such objection) within 5 days of the conclusion of the consultation process. (3) In determining whether there is an overriding public interest against disclosure of government information, Council will take into account any objection received by the Contractor. 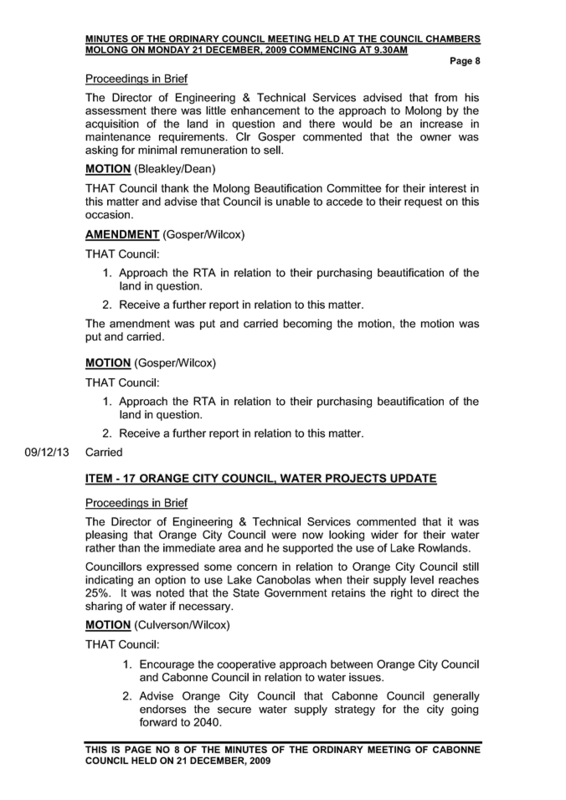 (4) If the Contractor objects to the disclosure of some or all of the information but Council nonetheless decides to release the information, Council must not provide access until it has given the Contractor notice of Council’s decision and notice of the Contractor’s right to have that decision reviewed. (b) where any review of the decision duly applied for is pending. (6) The reference in sub-clause (5)(a) to the period for applying for review of the decision under Part 5 of the GIPA Act does not include the period that may be available by way of extension of time to apply for review. THAT Council include the above clauses relating to access to information under the Government Information (Public Access) Act on all relevant contracts it enters into. To update Council following a public exhibition phase allowing public submissions to Council's advertised Code of Meeting Practice 2010; and to allow adoption of same. Once adopted this policy will replace the existing Policy. 4. Advertise and exhibit the annexed draft Code of Meeting Practice policy based on the Department of Local Government’s Practice Note as required under s361 of the Act providing 42 days for submissions. 5. Receive a further report at the February 2010 Council meeting to consider submissions and adopt a Code of Meeting Practice as required under s362 of the Act. The Draft Code, copy provided with the December Council business papers, was advertised with a closing date of 13 February 2010: no submissions were received at the time of this report being written. Should any submissions be received they will be tabled on Council meeting day. THAT Council adopt the draft Code of Meeting Practice policy. The Local Government Act requires Council to consider a quarterly report on the review of its annual Management Plan. The purpose of this report is to allow Council to assess its performance against its agreed objectives, actions and strategies. The Second Quarterly Management Plan review for 2009/2010 is attached which shows the culmination of the actions and strategies undertaken in the preceding quarter. · LEP Review – community consultations with villages commenced. · Village Strategy consultation with Yeoval, Cudal, Cargo and Manildra completed. · Manildra Sewerage Scheme – tenders approved. 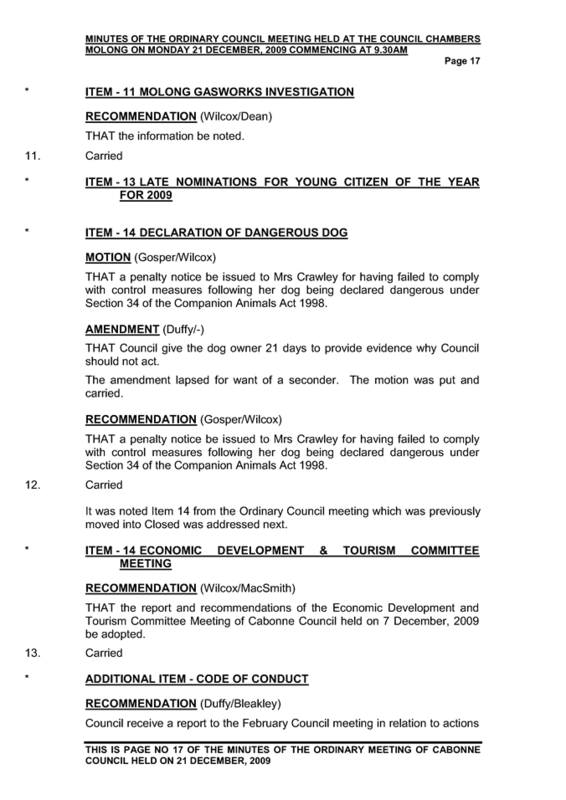 THAT, subject to any alterations that the Council deems necessary at the February meeting, the update of the Management Plan to the 31 December 2009, as presented be adopted. To provide Council an opportunity to present the 2010 NSW Local Citizen of the Year Australia Post Commemorative Stamp. Council has received the Australia Post Commemorative Stamp in honour of Clr John Farr. THAT Council endorse and present the commemorative stamp sheet to Clr Farr in recognition of his contribution to Cabonne. 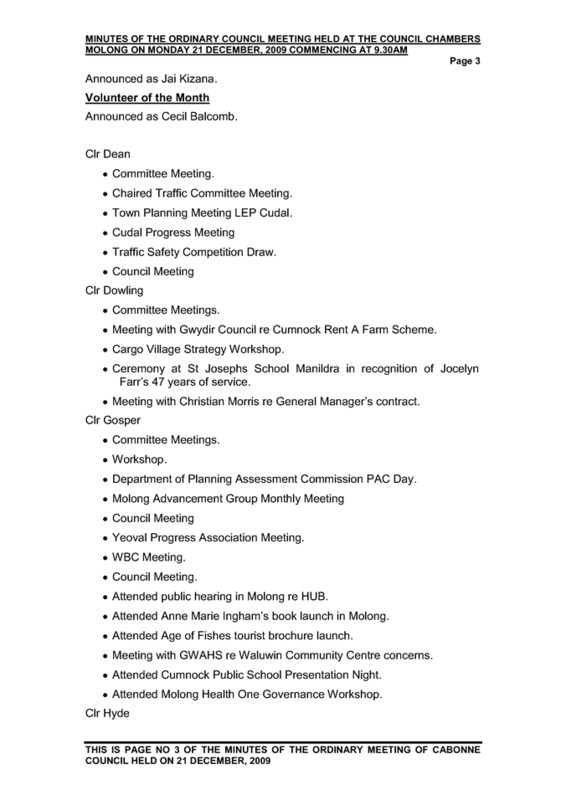 Attached is the report of the Community Services Committee Meeting of Cabonne Council held on 1 February 2010 for Council’s adoption. THAT the report and recommendations of the Community Services Committee Meeting of Cabonne Council held on 1 February 2010 be adopted. 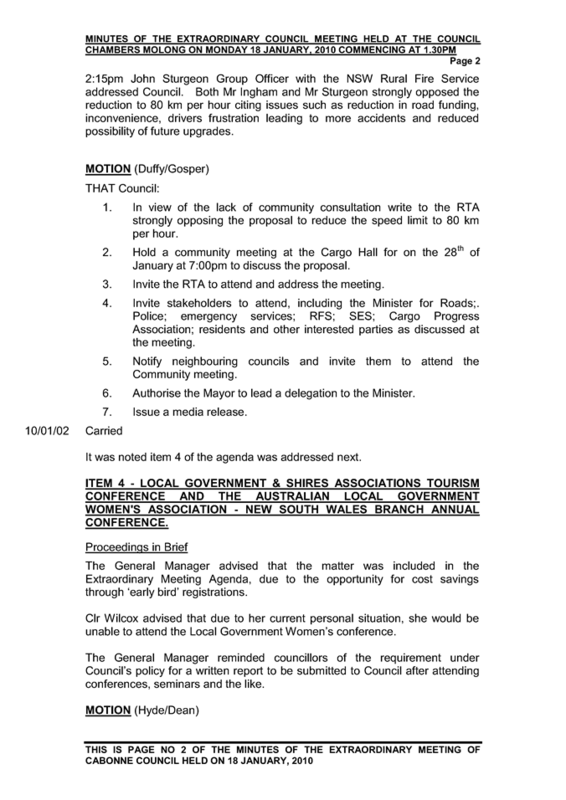 Attached is the report of the Economic Development and Tourism Committee Meeting of Cabonne Council held on 1 February 2010 for Council’s adoption. THAT the report and recommendations of the Economic Development and Tourism Committee Meeting of Cabonne Council held on 1 February 2010 be adopted. Determine delegation to attend the Conference. The annual Local Government and Shires Associations Water Management Conference is scheduled for 12-14 September 2010 in Orange. The conference is an opportunity for Councillors, LG professionals and Government Agencies to tackle water supply and sewerage services issues. In accordance with council policy, councillors wishing to attend the conference require a resolution from council. 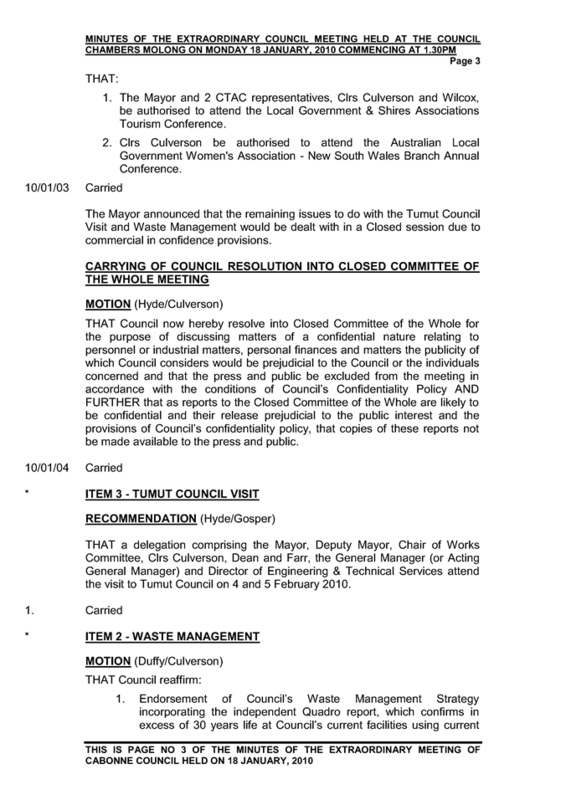 THAT Council receive nominations to attend the 2010 Water Management Conference. Seek Council directon for the improvements to the Ophir Reserve causeway. Approved funding from CIP to assist up grade. indufficent funds to up grade to desired standard. 1. Council apply to the Land and Property Management Authority for the acquisition of road from the northern bank of Summer Hill Creek (stated as Lewis Ponds Creek NSW Government Gazette 07.12.66) to the adjoining existing Council road. 2. Council provide preliminary costing on the upgrade of the crossing. Incorporating a 1 metre walkway, 2 box culverts, 4”x 5 x 40 metre concrete cap and sealing of the approaches. 3. Council assist the Trust by supporting a delegation to Commissioner Warwick Watkins if necessary. Council has previously approved CIP funding in the amount of $11,000 for repair to the concrete causeway. More recent advice concerning the Ophir Trust’s project included an up-grade of the causeway including widening of the existing 3m wide causeway by 1.2m. A preliminary estimate to undertake this work is $50,000. A more detailed estimate will require survey and coring of the existing structure to determine structural conditions. This will be done at the earliest opportunity. 2. If Lands funding is assured, undertake transfer of road to council. 4. Ophir Trust to obtain Department of Fisheries approval to repair and modify the causeway. 5. Establish who would own the causeway once refurbished. Subsequent to this resolution council staff have received advice from the Department of Lands that the Trust would be the authority for this project and make application to the Department to access funding assistance for the proposed up grade. Should council undertake Resolution #1 above, the road and causeway would become Council’s asset and therefore responsibility for any maintenance and up grade. 3. Assist the Trust by supporting a delegation to Commissioner Warwick Watkins if necessary. Council has received a proposal from a local Canowindra artist, David Isbester to re-do the mural on the outer wall of the Canowindra Pool. The exiting mural depicts the now defunct Marti’s Balloon Festival and advertises events no longer conducted. The proposed mural is depicted in the attachments and portrays an historic view of Canowindra and a number of historic sites and features. The mural is on the outer wall of the existing amenities building. This building is currently the subject of proposed improvements. It would be wise to defer the new art work until the proposed amenities up grade work has been completed. THAT: Council approve the new art work and funding from the Canowindra Town Improvements Fund and further that the work be deferred until the upgrade of the amenities block has been completed. 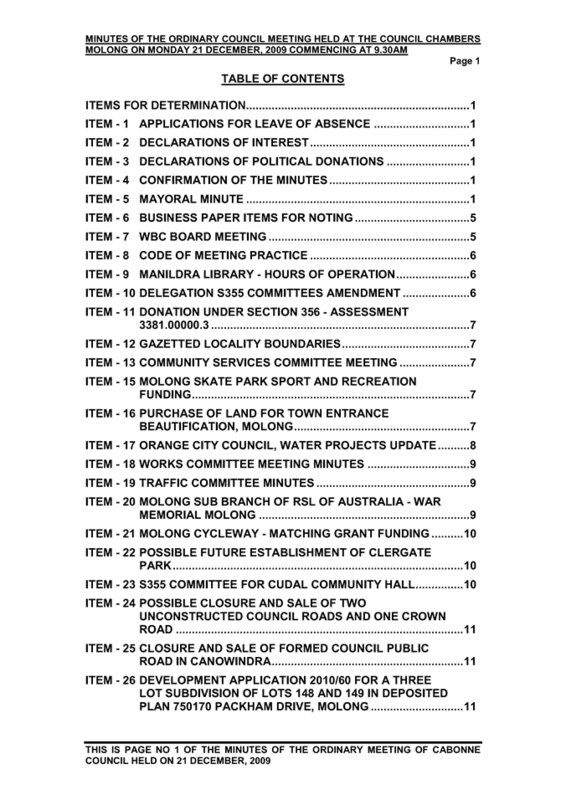 Applicant requests refund of adminstration fee paid when applying for closure and sale of formed Council public road in Canowindra. Item 25 of Council’s meeting dated 21st December 2009 explains the background to a request by RA & CM Kinsela Farm Supplies to close and purchase the road reserve described as Part Lane between Bowds Lane and Nangar Road, Canowindra and Part Lane between the aforementioned land and Lot 166 DP 883175. The applicant is seeking reimbursement of the application fee of $243.50 from Council as at the time of application there was no objections. All applications for road closures with the Department of Lands require an up-front non refundable application fee. THAT Council NOT reimburse the application fee to the applicant. 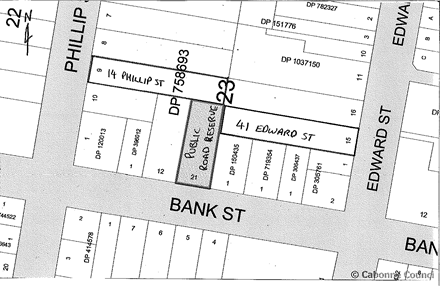 In 2009 Council received a written request to sell off an unused road reserve along Bank Street, between Edward Street and Phillip Street in Molong, as shown below. This portion of land had previously been highlighted as not being required for Council’s road network and investigations with the Department of Lands confirmed that the land in question is a public road reserve. Council resolved to submit an application to the Department of Lands for the closure of this section of road. Council staff have submitted the road closure application to the Department of Lands. Upon receiving the application the Department advertised the proposed road closure for public comment. This advertising period has now been completed and the Council has been advised that two objections to the closure were received. The Department has passed on copies of the objections to Council for its review and comment prior to continuing with the road closure application. An objection was received from Mr P O’Hara of 14 Phillip Street, Molong. The objection is based on the fact that Mr O’Hara currently uses the road reserve as a back yard access to his property along Phillip Street and notes that its closure shall limit this access as the front of his property is very narrow. It is noted in the objection that Mr O’Hara purchased the property over three years ago and that access through Lot 21 DP 758693 was available at that time. The other objection was received from Mr and Mrs Adams of 41 Edward Street, Molong. Similar to the previously noted objection, Mr and Mrs Adams highlight that the road reserve provides access to the rear of their property and the closure shall subsequently prohibit this access. Mr and Mrs Adams also highlight that they had previously made enquiries with Council regarding the purchase of the land but at the time were told that the land was required as an access road for adjoining properties. Investigations on-site show that both 14 Phillip Street and 41 Edward Street already have access to the back of the respective blocks from the street via driveways that continues past the houses. Whilst it is noted that access from the subject road reserve would be of benefit to these properties, the closure of the road reserve would not disadvantage the adjoining properties beyond other properties in the area that have no secondary access. It is also noted that a garage was constructed at the rear of 154 Phillip Street, being DA 2007/39. Review of the consent conditions for this DA shows that the garage was to be built without the road reserve off Bank Street being utilised for access. Regarding the issue raised by Mr and Mrs Adams relating to the purchase it is noted that any sale of the land would be by public notification rather than a direct sale to the adjoining land owner. This would have been the same when Mr and Mrs Adams first enquired about the purchase. 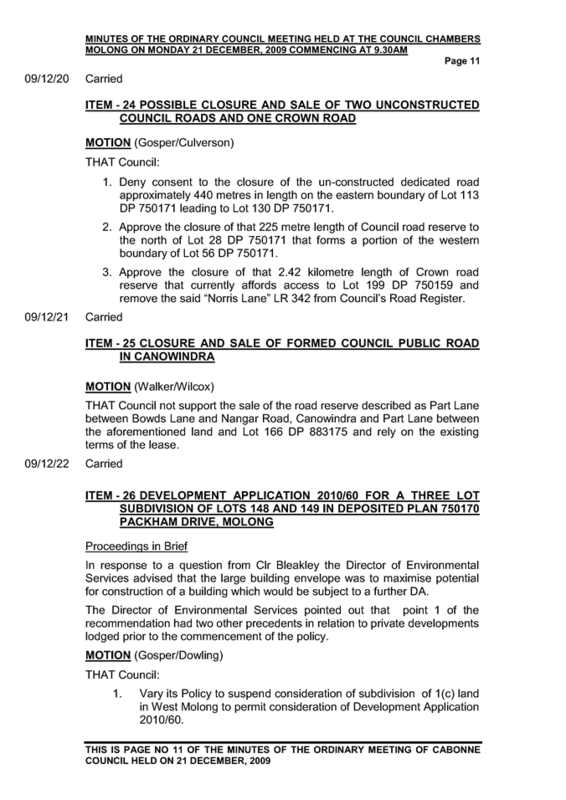 Based on the above information neither of the objections received from the advertising of the road closure notice would prevent Council proceeding with the closure. It is therefore recommended that Council advise the Department of Lands that it wishes to proceed with the closure and to advise the people who submitted objections of Council’s intentions regarding this matter. 2. Write to the Department of Lands advising them that it wishes to continue with the road closure application for the public road reserve through Lot 21 in Section 23, DP 758693. 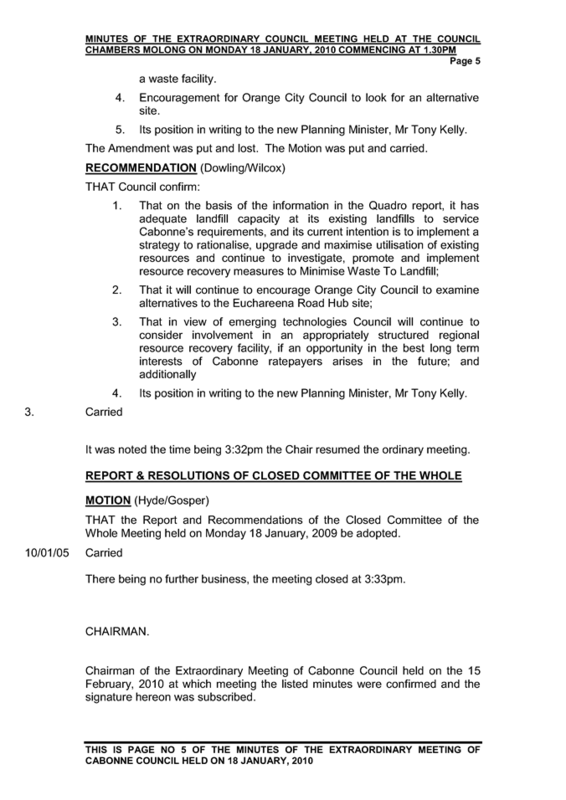 Attached herein is the report and recommendations of the Works Committee meeting held on Monday 1 February 2010. THAT the report and recommendations of the Works Committee held on Monday 1 February 2010 be adopted. Council’s approval is sought to vary conditions of consent applicable to Development Application 2010/46, being an approval to construct a dwelling upon land known as 406 Paling Yard Loop, Cudal. The proponents are Mr & Mrs W Whiteley. Development Consent was grated under Council’s delegated authority on 16 December 2009 for the construction of a 3 bedroom brick veneer dwelling upon land known as 406 Paling Yard Loop, Cudal. The consent was subject to eleven conditions of consent. The initial development application sought approval for a dwelling to be located upon Lot 281 DP 750139 Paling Yard Loop. The submitted plans indicated the land as Lot 275 in the same Deposited Plan. Council’s planning code permits a dwelling upon rural land where the subject land forms the whole of an existing holding, or upon land subdivided in accordance with the LEP and has an area of 100 ha or greater. The nominated lot(s) do not form the whole of an existing holding, and are less than 100ha in area. The proponent however owns adjoining rural land. Discussions were held with the proponent to nominate adjacent allotments that could be consolidated in title to create a 100ha parcel, thereby permitting the construction of a dwelling. The proponent agreed to nominate Lots 157, 275, 280 and 281 in DP 750139 to facilitate this matter. This agreement enabled the assessment of the development application to proceed. A condition of development consent was imposed to require the consolidation of existing land titles to create the 100 ha minimum lot. As the development is for a new dwelling gaining access to an unsealed road, Council’s s94 Roads Contribution 2007 applies to the development. The current state government review of s94 contribution plans has capped contributions to a maximum amount of $20,000 per lot where a dwelling is proposed. The contribution standard was applied to the development based on the distance of the development from the nearest sealed road intersection. It was noted during the course of site inspections and in discussions with Mr Whiteley that an abandoned dwelling was located on the nominate subject land. It was indicated by the proponent that the structure had been abandoned some 20 years ago. As part of the structure has some locate historic significance being of wattle and daub construction the Whiteleys had retaining the building as a relic. The lengthy abandonment of the building negates an ‘existing use right’ that may previously been attributed to the building, and its existence does not influence the intent of the Council’s s94 plan as the 2007 applies to new dwellings. Mr and Mrs Whiteley when advised of the standard conditions of consent were opposed in particular to the s94 contribution and sought a meeting on 18 December 2009 with the Mayor, Clr Culverson, the General Manger and the Director of Environmental Services. At that meeting it was explained to the Whiteleys that Council’s staff have no authority to vary Council policy documents and were required to administer the regulations of the LEP, DCPs and s94 Contributions Plan. Subsequently a modification application has been lodged to seek Council’s variation of two conditions of development consent. ‘ to delete condition 7 – unequitable application of DCP, amend condition 4 – Lots 275, 157, 280 and 281 DP 750139 have a restriction placed on the title requiring that the lots be sold together’. No other support information was supplied with the modification application. The s94 road contribution has been consistently applied by Council. The contribution applies to subdivisions and rural dwellings throughout the council’s rural 1(a) and 7(c) areas. The s94 road contribution was capped at $20,000 in accordance with Planning Circular PS 08-017 issued in February 2009. It is suggested that condition 7 be retained. At present the condition of consent requires consolidation of the four nominated allotments into a single parcel of land prior to the construction of the proposed residence. The proponent seeks to have a restriction placed upon the existing land titles so that the four nominated lots can only be sold conjointly. 2. That condition 4 of Development Consent 2010/46 be amended to read: The applicant, at their own cost, is required to have a restriction placed on the sale of land burdening lots 157, 275, 280 and 281 in DP 750139. The terms of the section 88b instrument are to require all lots to be sold together and benefiting Cabonne Council. ITEM 30 - Modification of DA 2006/251 subdivision of Lot 11 DP 546140, Euchareena Road , Molong. Council approval is sought to modify the 73 Lot subdivision approval of Lot 11 DP 546140, Euchareena Road, Molong. 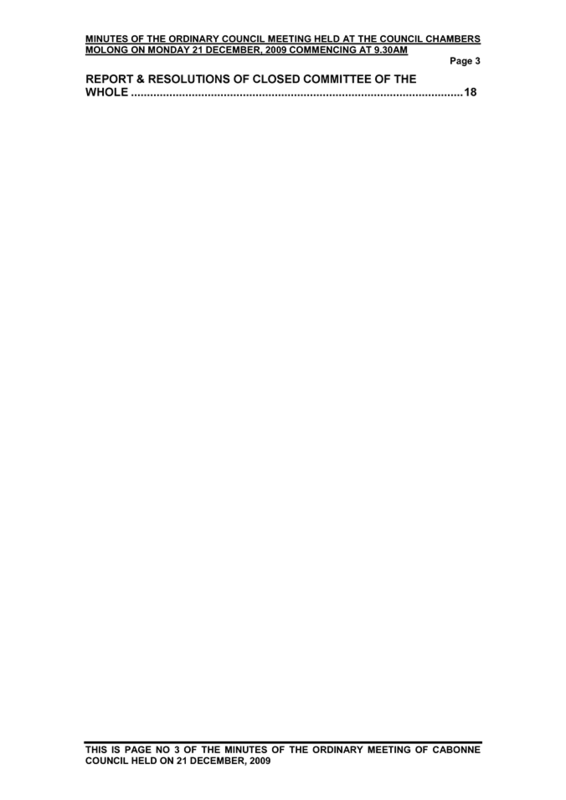 The applicant is Regional Estates Pty Ltd.
b. The new owner of the subject land be recorded as Wakefield Ashurst Developments Pty Ltd.
2. Condition Number 5 requires the applicant to upgrade Euchareena Road to a Non Rural Class 2 Level 2 standard and upgrade the intersection of Betts Street and Euchareena Road. It is proposed that the applicant make a payment of a monetary contribution in accordance with Council’s Section 94 Road Contributions for Small Rural Holdings instead of upgrading the Road. 3. Condition Number 13 requires the maintenance performance bond of 10% of the value of the road works undertaken for the project. It is proposed by the applicant to reduce the amount to 5% in accordance with Australian Standards. 4. Condition Number 19 requires a centralised water reticulation system be provided for external use throughout the development along with a prohibition of the sinking of bores. The applicant requests a covenant be placed on the linen plan for the development requiring any future dwellings be required to install a 90,000 litre rainwater tank for potable supply and a mains extension of Molong town raw water supply to the development for domestic purposes. 5. Condition 37 and 42 require a Right of Carriageway to serve proposed Lots 58 and 59 to be created and constructed 6 metres wide. 6. The applicant requests that a 3 metre reserve be created to link the estate to Back Saleyards Road. 7. The applicant requests a condition of consent be created to allow the developer to stage the development in a flexible manner based on demand and provision of services. A number of meetings were facilitated between Council staff and the applicant to discuss the proposal. The initial assessment of the modification proposal revealed that the proposal is substantially the same as the original development consent. Neighbour notification of the modification proposal has not been undertaken as the subdivision pattern remains unaltered from that previously approved. In accordance with Section 96(1A) of the Environmental Planning and Assessment Act 1979 the proposed modification is of minimal environmental impact and is substantially the same development for which consent was granted. The subject land is zoned 1(c) Rural Small Holdings under the provisions of Cabonne Local Environmental Plan 1991. Subdivision of land within this zone is permissible subject to Council’s development consent. The proposal is not contrary to the aims of the LEP or the objectives of the 1(c) zone. The proposed subdivision modification does not affect the lot sizes or layout as previously approved by Council. There are no Regional Environmental Plans that apply to the subject land. There are no State Environmental Planning Policies that apply to the modification application. There are no draft environmental plans that relate to the subject land or proposed development. The modification is in accordance with the DCP provisions. 1. Water Agreements – Special on Rising Mains (1988). 2. Molong Water Supply – Private Connections (1995). 3. Molong Water Supply – Properties in 1(c) Zones (2000). That Council adopt the following conditions relating to special water agreements and that all Special Water Agreement users be requested to sign a copy of an agreement based on the conditions. The owner of the property to pay Council the FULL COST of connecting the Council's water main, such amount to be paid prior to actual connection at a standard satisfactory to the Director of Engineering and Technical Services. Annual Special Water Agreement charge to be levied as at 1st January each year and to apply for the whole of the year, whether supply is maintained for the whole of the year or disconnection made during the year. Any further private connections to raw or treated trunk water mains be disallowed in the Molong Water Supply Scheme because this is a delivery main not a reticulation main. 2. Applicant meeting Council’s headworks connection charge. The impact of the proposed modification application upon Council’s policies is discussed later in this report. The proposed staging of the development allows the developer to release allotments in a flexible manner based on demand. The modification to allow staging of the development will not contravene the LEP provisions. The demand of 73 new allotments will have a significant impact on the levels of Molong’s water supply. Council reserves the right to restrict water supply to the development as the supply of water to the village area takes first precedent. Council’s Engineering Department suggest water be restricted to the development should the water supply dam level fall below 65%. The modification of consent will attract a water headworks charge of $4134 per allotment. Access to the development will be generally via Euchareena Road. The modification will attract a section 94 road contribution of $2,437.10 per allotment for the upgrade of Euchareena Road, and the Betts Street and Euchareena Road intersection. The development will attract a $300 per lot contribution for a Bicycle pathway connecting the development to the Village. A 3 metre wide bicycle path will link the estate to Back Saleyard Road. This bicycle path will become Council operational land. Neighbours were not notified due to the minor adjustments proposed to the development. The proposed development is considered to be of minor interest to the wider public due to the relatively localised nature of potential impacts. The proposed modification is permissible with the consent of Council. The applicant has adequately demonstrated that proposed development complies with the objectives and provisions of the Cabonne LEP 1991. The modification is consistent with the provisions of section 96(1A) of the Environmental Planning and Assessment Act 1979. A section 79C assessment of the proposal indicates that the development is acceptable in this instance. An amended draft Notice of Approval is attached. 1. Council vary its water supply policy to allow a raw water supply to the development. 2. Council amend the notice of approval of a 73 lot subdivision and update owner details. 3. Council grant consent to modified application DA 2006/251 for the 73 lot rural residential subdivision of Lot 11 DP 546140, Euchareena Road, Molong subject to the attached amended conditions. 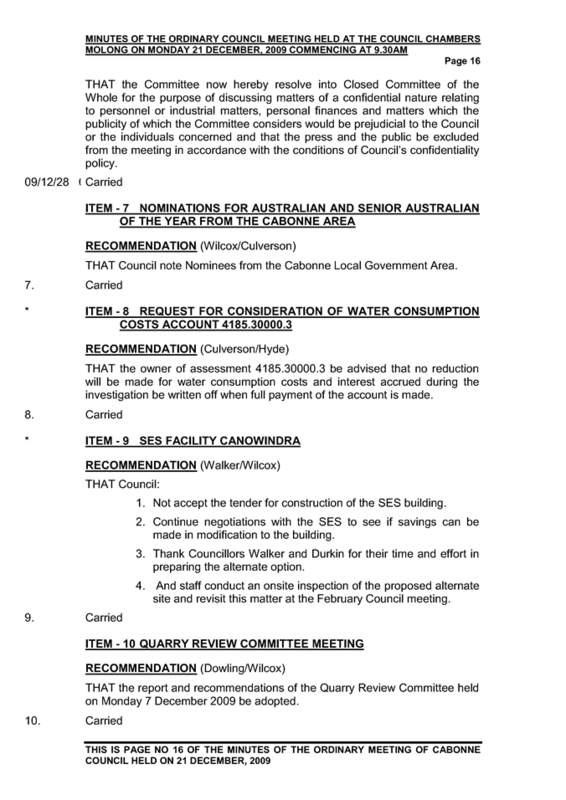 Attached is the report of the Environmental Services and Sustainability Committee Meeting of Cabonne Council held on 1 February 2010. THAT the report and recommendations of the Environmental Services and Sustainability Committee Meeting of Cabonne Council held on 1 February 2010 be adopted and carried Motions be noted. Council’s Complaint Management Policy forms part of Cabonne’s overall commitment to excellent Customer Service and should be read in conjunction with the Customer Service Policy Statement, Objectives and Guarantee. This policy will assist Council achieving its objective of quality Customer Service through ensuring that all complaints are dealt with in the most effective and efficient manner. This policy and procedures are intended to be easy to understand and explain, and will assist staff in resolving, conciliating and investigating complaints from the simple to the complex. This policy has been prepared in accordance with the DLG Practice Note 9, July 2009 – a joint publication of the NSW Ombudsman and the Department of Local Government. On its own, a request for a council service or the exercise by a council of its regulatory functions is not a complaint about Council. • the lodging of an appeal or objection in accordance with a statutory process, standard procedure or policy (unless this is recorded as a complaint about the council’s decision making). • a submission relating to the exercise of a regulatory function (eg an objection to a development application or a submission on a policy). Complaints Management Policy - A Complaints Management Policy refers to an organised way of responding to, recording and using complaints to improve customer service. It includes procedures for customers to make complaints and provides information to managers and staff that can assist them to prevent customer dissatisfaction happening in the future. Cabonne Council welcomes, supports and encourages valid and non-vexatious complaints (and compliments) and will ensure that every complaint is received courteously, investigated and acted on quickly and appropriately. Council recognises that an effective Complaints Management Policy forms part of good customer service and that feedback from customers is essential in understanding customer expectations and levels of satisfaction. It is the intention of the Council to use the information resulting from the effective implementation of the Complaints Management Policy to improve the level of service Council provides to its valued customers. · By lodging a complaint through Council’s website. * – these should be recorded on Council’s EDRMS system and recorded in the Service Request Library under the Corporate category of “Complaints”. A reference number (Doc ID) should be given to the complainant. Council utilises a Three tiers of review system - an approach to complaint handling considered to be most effective. First-tier - The aim is to resolve the majority of complaints at the first-tier, the frontline. Registration and attempted resolution by frontline staff of complaints, or referral to an appropriate person or agency to deal with same (eg code of conduct issues, protected disclosures, allegations of corrupt conduct). Second-tier - If a complainant is still dissatisfied, the complaint is reviewed or investigated by the Manager or Director, a process overseen by the Public Officer, and the results of the review are reported to the complainant. If the complainant remains dissatisfied, further options to achieve a settlement may be available and include conciliation, mediation, or further direct negotiations over remedying the grievance. Third-tier - If the complaint cannot be resolved within the council, the complainant is referred to an outside agency such as the NSW Ombudsman or the Department of Local Government. It should be noted that where the complaint concerns or may concern corrupt conduct, it should be reported to ICAC at the first-tier stage as outlined above. If complaint information is to be used to identify defects in service provision and to identify where the expectations of the community are not consistent with the standard of service being provided, it is important that complaints be recorded. In order for a report to be prepared for the Directors meetings as required in the Reporting Procedure of tis policy, the Public Officer must be able to access records of complaints. All oral complaints should be recorded on Council’s EDRMS system and recorded in the Service Request Library under the ‘Corporate’ category of “Complaints” by the staff and by receiving the complaint. A reference number (Doc ID) should be given to the complainant. All written requests wether received by correspondence or through appointment of a complaint by Council’s website should be recorded by Council’s Records staff on Council’s EDRMS system and registered to the “Complaints” folder at OFFICIAL RECORDS LIBRARY/CUSTOMER SERVICE/PUBLIC REACTION. It should be noted that with all complaints falling under Protected Disclosures provisions all necessary and reasonable steps should be taken to ensure that the identity of persons who make disclosures (a member of staff or councillor), and the persons the subject of disclosures, are kept confidential. · the Nominated Disclosure Officers: Administration Manager and Human Resources Officer. · the Disclosure Co-coordinator, Director of Finance and Corporate Services. 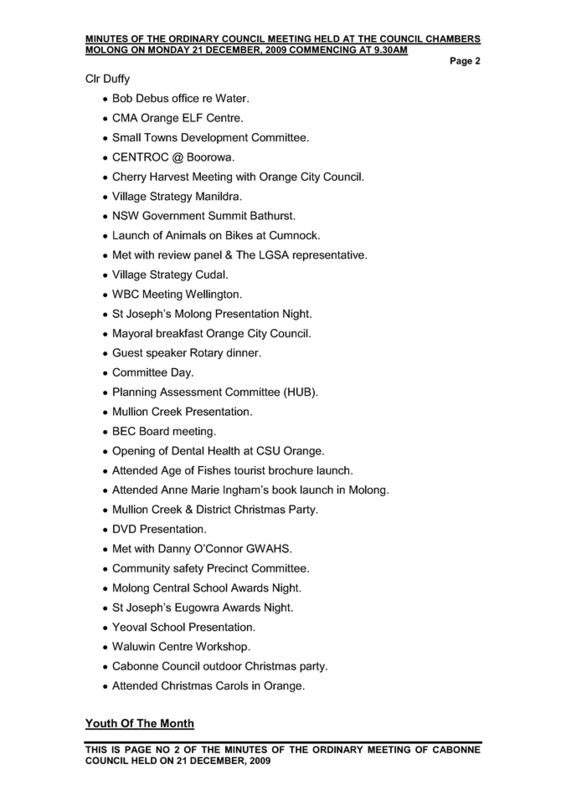 · the Mayor (if the disclosure concerns or involves the General Manager or a councillor). Refer to the Protected Disclosures Policy for more detail. Front-line staff are responsible for attempting to resolve any complaints received in the first instance. In circumstances where this is not possible the complaint is to be referred to a more senior staff member e.g. relevant manager or director, and the public officer is to be advised. In keeping with the three tiers of complaint handling review system adopted by Council, complaints unable to be resolved at this level may be referred externally. · Answers to complaints will be easy to understand and will not contain jargon. They will be clear, concise, straight to the point and will directly address the original complaint. Where it is determined that Council is unable to help or adequately respond to a complaint, the complainant will be advised of their options including their right to appeal to another public agency. · Explain methods of recourse if the customer is dissatisfied. If the delay is due to seasonal conditions such as road grading or tree planting and the request is considered reasonable, then it is to be placed on the forward work schedule and the customer notified. If the customer is satisfied, then this complaint may be marked as resolved. The Public Officer is responsible for providing a report to the Directors meetings including frequency of complaints made and a breakdown by categories of the subject matter of the complaints, etc. This report will provide an opportunity for the Executive to undertake analysis and determine measures for non recurrence (as applicable) of the circumstances which caused the complaint(s). Useful information from complaints may be fed back to the relevant sections of Council to allow improvement. Whilst complaints, as defined, are small in number compared to the daily interactions Council has with its customers, they are a significant factor in the way Council is perceived by the public. Council has resolved that Customer Service and Communications are a high priority and accordingly a “customer” focus is required – meeting the needs of the community is our core business and complaints should be seen as an opportunity, not a nuisance. Council staff will ensure complainants will be helped and supported to make complaints, with the experience made as easy as possible. Refer to the DLG Practice Note – “FIRST-TIER: FRONTLINE COMPLAINT HANDLING Some guidelines for what staff should do” for some handy advice. Ii certain circumstances there will be a need to take some action to fix the problem presented. This may involve providing the service not delivered, undertaking to review the decision or action complained about, undertaking to make sure outstanding action is taken in a defined time period, (and doing so, even if the action is someone else’s responsibility), or providing some other remedy or compensation for actions that cannot be undone. 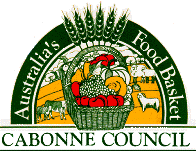 Cabonne Council, like all councils, has an obligation to use resources efficiently and effectively, at some point, it may be necessary and reasonable for council to decide to limit the nature or scope of its responses to unreasonable conduct by complainants. However, these situations should be the exception rather than the rule. Council will maintain confidentiality of complaint information (within the provisions of Council’s Access to Information Policy and FOI / GIPA legislation) with a view to safeguarding complainants against victimisation/retribution. At times staff may be exposed to unreasonable complainant conduct. Strategies to deal with these situations are available in the DLG Practice Note – “MANAGING UNREASONABLE CONDUCT BY COMPLAINANTS”. The General Manager has a duty to report to ICAC any matter he or she suspects on reasonable grounds concerns or may concern corrupt conduct. The General Manager has an obligation to refer complaints alleging breaches of the pecuniary interest provisions of the Act to the Department of Local Government. 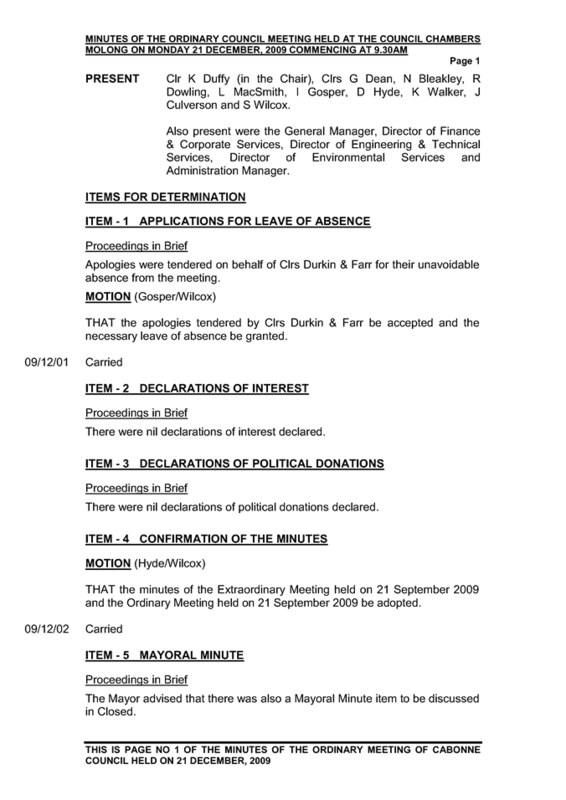 Where a General Manager reasonably suspects that a councillor has not complied with the provisions of the Code of Conduct relating to the disclosure of political donations or the manner of dealing with any perceived conflict of interest in relation to political donations, the General Manager is to refer the matter to the Department of Local Government. The revised Model Code of Conduct, which took effect on 27 June 2008, provides the General Manager with a wide range of options for managing complaints made under the code of conduct. The General Manager must determine to take one of the prescribed courses of action in relation to the complaint. The revised Model Code of Conduct provides the Mayor (in the case of a complaint about the General Manager) with a wide range of options for managing complaints made under the code of conduct. The Mayor must determine to take one of the prescribed courses of action in relation to the complaint. The Public Officer is responsible for reporting regularly to the Director’s meeting in accord with Reporting Procedure contained in this policy. Where councillors seek information that has been previously provided or where requests become so numerous or onerous as to impact on the operations of council, the General Manager may determine to refuse to respond to further requests in relation to the matter. Where the General Manager does so, he should prepare a report to council explaining his or her reasons for doing so. This should include an explanation of the history of the matter, the steps taken to address the complainant’s concerns and why the restriction has been imposed. The feedback about council performance that a complaint may give can be valuable. It can lead to a policy being reconsidered or better targeting of council resources. In many cases, complaints will echo and reinforce staff concerns about similar matters. The feedback collected, properly reported, may itself be a catalyst for change and continuous improvement. Council provides an opportunity for customers to provide feedback via its website on the Complaints & Comments feature which allows customers to use a form to submit comments or complaints to the Council. Complaints may also be made by telephoning or calling in person at Council’s offices at Cudal, Canowindra or Molong. Council accepts oral and written complaints through the methods previously documented. Council generally only acts on anonymous complaints where the matter is relatively serious and there is sufficient information in the complaint to enable an investigation to be conducted. All frontline staff are responsible for receiving, registering and ensuring the resolution of straightforward, minor complaints as speedily as possible. Frontline staff may assign tasks to their supervisor if they are unsure who should attend to the problem. In the case of more serious complaints, the frontline staff shall direct the complaint to the most suitable authority either in Council or in another agency. In such cases, the frontline staff may refer to the Public Officer for guidance. Most complaints should be capable of resolution by frontline staff. In some matters however, complainants will not be satisfied unless a more senior officer has dealt with their problem. As stated previously, some types of complaints should be automatically referred on to a supervisor, Director or the Public Officer. Internal review, conciliation and investigation of complaints do not always result in resolution. When the complaint is serious or the complainant’s demands will continue to impact on the time and resources of staff, recourse to external sources of review is appropriate. This can take a number of forms. Sometimes a neutral third party can help settle an escalating dispute. A number of both private and public sector bodies use the services of professional mediators in such situations. The mediator, through a formal face-to-face process of discussion, helps the parties to clarify issues and reach a solution agreeable to both sides. For more information about mediation, see Chapter 4 of The Complaint Handler’s Tool Kit, Public Sector Mediation Guidelines, NSW Ombudsman, June 2004. There are a number of accountability/complaint bodies established by the NSW Government that receive and investigate complaints about the conduct of councils. The Department of Local Government has a statutory role in relation to the investigation of pecuniary interest matters, political donations disclosure matters, councillor misbehaviour and protected disclosures relating to serious and substantial waste. Referral of such matters to the department is discussed later in this practice note. The department also monitors the performance of councils and, in line with this role, focuses on complaints that indicate a serious breakdown in council operations or serious flaws in key council processes. The NSW Ombudsman has jurisdiction to investigate complaints alleging maladministration by councils, councillors and council staff. ICAC has jurisdiction to investigate complaints alleging corrupt conduct by councils, councillors and council staff. Depending on the nature of their complaint, dissatisfied complainants can be referred to these agencies or a joint approach made seeking an external review. Councils have a statutory obligation to refer complaints about certain matters to external agencies. Under section 11 of the Independent Commission Against Corruption Act 1988, a General Manager of a council has a duty to report to ICAC any matter he or she suspects on reasonable grounds concerns or may concern corrupt conduct. The Department of Local Government is empowered to investigate breaches of the pecuniary interest provisions of the Local Government Act. The Act prescribes how pecuniary interest matters may be referred to the department. The Pecuniary Interest Guidelines, issued by the Department of Local Government in June 2006, make it clear that the General Manager has an obligation to refer complaints alleging breaches of the pecuniary interest provisions of the Act to the department. The guidelines state that where a General Manager becomes aware of an apparent or possible breach of the pecuniary interest provisions by a councillor, committee member, adviser or designated person, he or she should review all the relevant information. If, having done so, they consider the information shows evidence consistent with a breach, he or she should notify the department and forward relevant material and a short statement of relevant circumstances. The Model Code of Conduct for Local Councils in NSW also states that complaints regarding pecuniary interest matters should be reported to the Director General of the Department of Local Government and should not be dealt with by the council’s conduct review committee/reviewer. 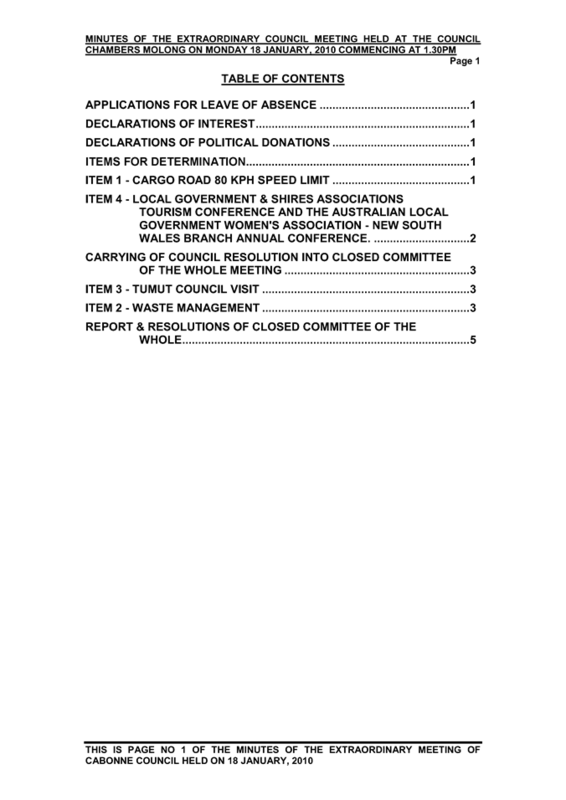 Under section 328B of the Local Government Act, where a General Manager reasonably suspects that a councillor has not complied with the provisions of the code of conduct relating to the disclosure of political donations or the manner of dealing with any perceived conflict of interest in relation to political donations, the General Manager is to refer the matter to the Director-General of the Department of Local Government. The General Manager should refer such matters to the Department of Local Government at first instance and they should not be dealt with by the council’s conduct review committee/reviewer. Where rights of appeal to outside tribunals or other legal remedies exist, dissatisfied complainants should be advised of these avenues of redress after all others have been exhausted. Where a complaint is received which alleges corrupt conduct, the General Manager must be notified in all instances. These complaints will be dealt with in accordance with Council’s internal reporting policy: the Protected Disclosures Policy. · A carry over figure of matters under inquiry or not resolved at report date. The Director of Finance and Corporate Services is responsible for the overall management of the Complaints management Policy and associated system. Directors and/or the Public Officer is responsible for reviewing complaints which were not (in the complainant’s opinion) satisfactorily resolved. The Administration Manager and Human Resources Officer as Nominated Disclosure Officers and the General Manager are positions to whom internal disclosures can be made in accordance with the Internal Reporting System. The Director of Finance and Corporate Services assumes the responsibilities of the Disclosure Co-coordinator.. The Public Officer is responsible for the day to day management of the Complaints Handling Policy. Additionally the Public Officer is responsible for reporting regularly to the Director’s meeting in accord with Reporting Procedure contained in this policy. Are responsible for dealing with complaints referred to them which could not be resolved by front line staff. Front line staff are responsible for taking, recording and resolving (or referring) complaints. All staff are required to acquaint themselves with the DLG Practice No. 9 – Complaints Management In Councils. The Mayor is a position to whom internal disclosures can be made in accordance with the Internal Reporting System if the disclosure concerns or involves the General Manager or a councillor. Reviewed in accordance with DLG Practice Note No. 9. Report to February Council with update. Retain - database to be updated to 2009 version. Retain with amendment to remove "(previously $10,000)". 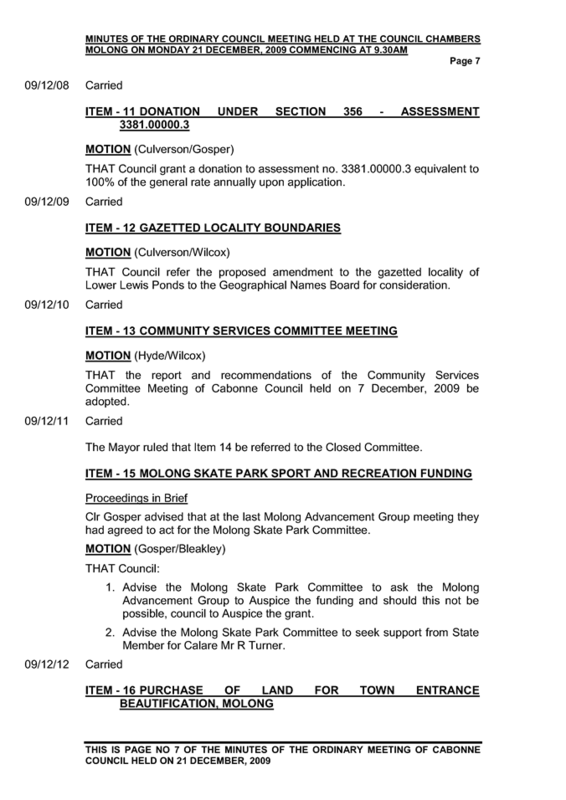 Retain with amendment to: "That Council cease hire of chairs and tables from the Molong Community Centre unless a suitable monitoring arrangement is put in place and equipment at Cudal Community Centre be monitored for any loss or damage." Retain with amendment - "Cabonne strongly disagrees with growing Genetically Modified crops." Retain - to be incorporated into LEP/DCP review. Retain - to be incorporated into DCP/LEP review. 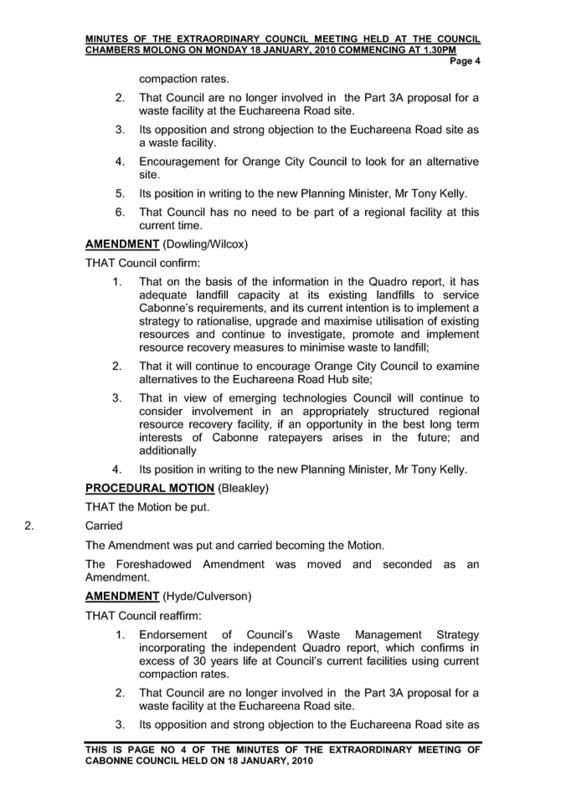 Retain with amendment - being deletion of the words "Ophir Ward". Retain - to be reviewed as part of HR Manual review. 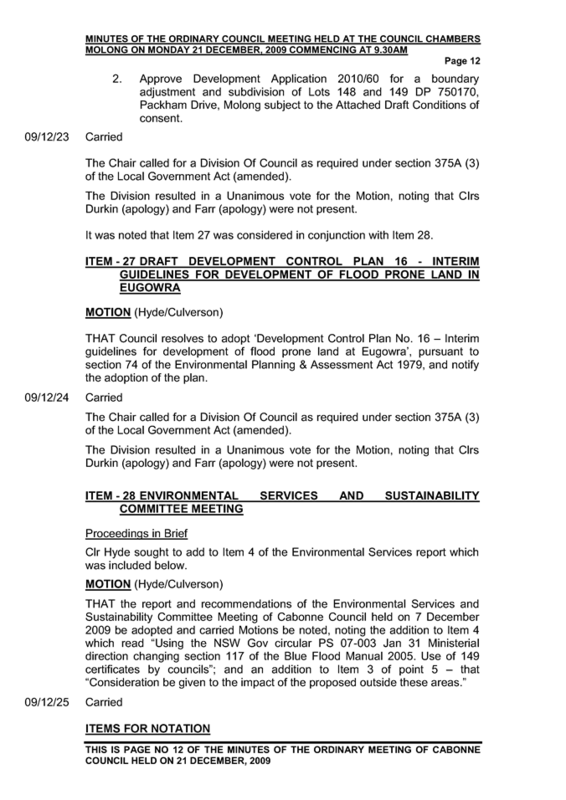 Amendment required - see separate Report to February Council. Retain pending full implementation of GIPA Act (replaces FOI Act). Retain pending a Local Purchasing Policy which is being developed which will cross reference. 1. Council’s organisational structure consisting of the General Manager, Finance and Corporate Services, Engineering and Technical Services and Environmental Services Departments be endorsed. Review required - pending new Tendering Guidelines recently adopted. Retain with amendment that "... and that the arrangement be reviewed after twelve months " be deleted. Retain with amendment - add "annual" to Media releases. Pending merging with "Privet Removal - Molong Policy". Retain - to be combined with "Prosecutions" policy. Retain - to be combined with 2 previous policies. Retain with amendment adding an additional prize for Best Presented Local Exhibit. Retain with amendment to read "Council" not "Country". Retain – pending combining with "Privet Policy". Retain with amended name to “Temporary Road Closures (other than emergency or road works)"
Retain with amendment that: “Council will remove tree trimmings in conjunction with Country Energy power lines maintenance." Retain with amended title to "School Bus Stops"
Retain - NOTE: all Load Limit policies to be placed on one policy. Retain - with amended title to "Road Load Limits - Rocky Ponds Road"
Retain - with amended title to "Road Load Limits - Vittoria to Millthorpe Road"
All Molong Water Supply policies to be combined and retitled as Cabonne Water Supply. Retain with amendment to read "For Cross Connection Control in Water Supplies Council is to install non-testable devices on all hazard premises." DETS report May Council - combine with "Privet Removal - Molong Policy"
New EDM report to May Council. DETS to report on signage erected to March Council. DES report to April council. All apologies by Council in connection to Council’s roads or footpaths must be issued in accordance with this policy. Reviewed by Risk Management Officer - reference to legislation added. This policy has been developed taking into consideration the provisions of the Civil Liability Amendment (Personal Responsibility) Act (The Act) and advice from the NSW Ombudsman’s Office and Statewide (Council’s Underwriter). Council may consider apologising to an aggrieved person where it appears, prima-facie, they have suffered some detriment in connection to Council’s roads or footpaths. Apologies should not be made for potential liabilities as set out in s3B of the Civil Liability Act 2002. An apology as defined in the Act is “an expression of sympathy or regret, or of a general sense of benevolence or compassion, in connection with any matter whether or not the apology admits or implies an admission of fault in connection with the matter” (s68). The General Manager is responsible for the overall control and implementation of the policy. Directors and Managers are responsible for the control of the policy and procedures within their areas of responsibility. Supervisors are responsible for ensuring that all employees within their area of responsibility follow all procedures in relation to this policy. Employees must undertake all procedures in relation to complying with this policy. All labour hire personnel and contractors must adhere to Council’s policies and procedures. Apologies issued by Council will be done so promptly and sincerely. All apologies will be in writing. An apology may only be drafted by Council’s Risk Management Officer and signed off by the General Manager on apology letters that are acceptable to the Council’s Underwriter for use in conjunction with this policy. An apology will not make any admission, offer, promise or payment in connection with any occurrence or claim. Where Council becomes aware of an act or incident through legal representation, then advice should be sought from Council’s underwriter as to whether an apology would be appropriate. Apologies will not extend to an explanation of how the act or omission occurred. 1. Scope – a description of the relevant event to which the apology applies. Specific details of where the event occurred should be included. Do not include any assumptions on how the event occurred. 2. Detriment – Recognition that the affected person has suffered some detriment and acknowledgement of the types of detriment suffered. These can be physical and/or emotional. 3. Action Taken or Proposed – a statement of the action taken. The Occupational Health and Safety of all persons employed by Cabonne Council and those visiting the organisation are considered to be of the utmost importance. Resources in line with the importance will be made available to comply with all relevant Acts and Regulations and to ensure that the workplace is safe and without risk to health. This policy exists to record Cabonne Council’s view that the Occupational Health and Safety of all persons employed by and those visiting the organisation are considered to be of the utmost importance. Addresses the responsibility of employer and employees and outlines goals for OHS. The General Manager accepts overall responsibility for the effective management of workplace health, safety and welfare. All contractors and sub-contractors engaged to perform work on Council premises or locations are required to comply with Council’s OHS policies and procedures and to observe directions on health and safety from designated officers of Council. Cabonne Council accepts responsibility for the safety and occupational health of its employees in their workplace and will take all practical steps to establish and maintain an effective accident prevention and safety awareness programme and to comply with all statutory requirements with regard to safety and health as applying to all phases of Council’s operation and functions. Council and its employees acknowledge that employees also have a responsibility to act in a safe manner and observe Occupational Health and Safety requirements for their own and their workmates’ safety. This policy relates to Council’s responsibilities in relation to workplace safety audits and inspections. This policy is a regulatory requirement under the OHS Act 2000. This policy covers all council employees as well as hire and contractor employees. Supervisors are responsible to ensure that all employees undertake their duties in a responsible manner and follow all procedures in relation to this policy. All labour hire personnel and contractors are to adhere to Councils policies and procedures. Council is to ensure there is in place an arrangement for conducting workplace safety audits and inspections. The workplace safety audits and inspections are to assist Council determine the effectiveness of the risk control procedures and to identify any shortcomings in the procedures. OHS Worksite Inspections are required to be conducted for all Cabonne Council permanent worksites in May and November. This is to be done using the OHS Inspection Checklist v2, which is available on Council’s Intranet. The checklist is to be forwarded to the Risk Management Officer to follow-up any required actions. Council’s OHS Committee will complete an OHS Worksite Inspection on each of Council’s permanent worksites at least once per year. The Risk Management Officer will undertake the StateCover OHS Self Audit and Statewide Public Liability Audit on an annual basis. A report of the results will be prepared for Council. Automatic Filing amendment due early 2010. Specs for Actions Register completed. Upgrade due 2nd qtr 2010. Draft Training & Development Plan approved. Reported to October, November and December meetings. Ward Review Committee to meet in third quarter. Contract made with Alliance Partners regarding software. Meeting with Engineers and Finance Managers regarding valuation of assets. Presentation at September Council meeting. Councillor workshop held December. Data analysis finalised. Draft plan written. Russell Turner attended November Council meeting. Economic Development Manager presented to forum internal audit. 7.1 Ongoing financial sustainability maintained. Presented to November Council meeting. 9. Satisfactorally implement State Government Integrated Planning and Reporting requirements. Presentation made to September Council meeting.